"Family Christmas Portrait in the Dutton Papers "
This black and white image is part of the Dutton Family papers, and includes a note on the back: Merry X'mas ... from "the Surrys." Xmas 1896. The mat is stamped with the Partridge studio stamp, Boston and Vicinity. The Dutton family of Ellsworth was related to the Craig and Briggs families of Augusta, Maine. 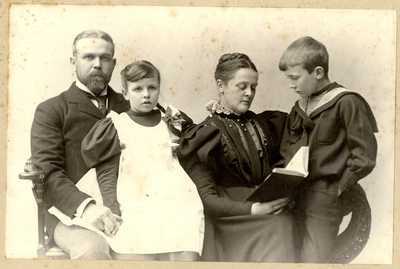 The family papers includes many photographs taken by professional studios in Maine and the northeastern United States.